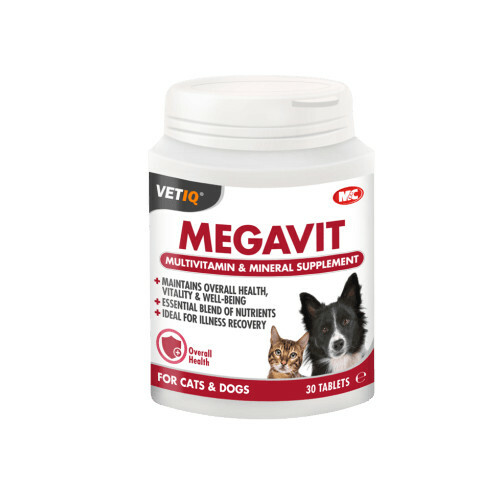 VetIQ Megavit (previously Megavit-UM Plus) from Mark & Chappell is a highly palatable multivitamin and mineral supplement which also contains essential trace elements. Calcium, Phosphorus and Magnesium have been included to aid in bone formation, growth and maintenance. Trace elements have also been included to support nerve transmission, immune responses and metabolism. Suited to puppies during early growth stages and pregnant and lactating mothers with increased requirements. There are currently no questions for Mark & Chappell VetIQ Megavit for Dogs & Cats - be the first to ask one!